Back in the coffee saddle! The last couple of months have been a little hectic with the opening of our new location at the Gates and Hillman Centers at CMU. But over the holiday break I had the chance to get caught up on cupping all our new coffees. 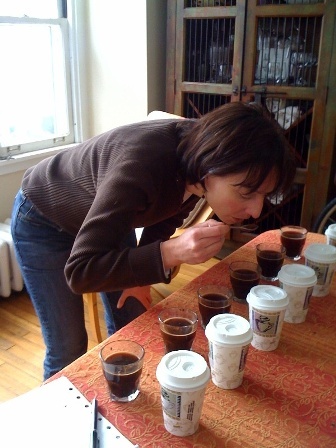 On my time off there was lots of cupping happening at home- one of my favorite things to do! We are back in the cupping saddle again at Tazza D’Oro beginning this week. We are now cupping every Weds at 3:30 pm and you are all welcome to attend. No experience necessary just bring your rad selves and enjoy the experience of slurping in public! After each cupping we brew the coffees in a French Press and Chemex!